Mashery is pleased to announce the availability of a new feature that enables our customers to apply role-based access control rules on the APIs published through the Mashery platform. Whether ensuring that only internal developers see the I/O Docs for internal APIs or special partners registering for APIs that only they should get access to, Access Control on APIs can be used to ensure that users with specific roles can get access to only those APIs, whether services or package plans, that you want them to get access to. 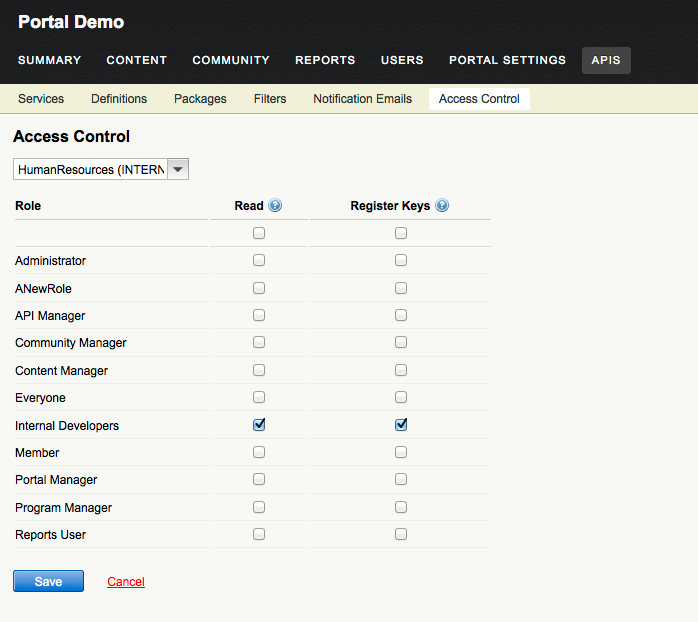 This feature allows a customer to expand its use of the portal as a documentation, learning and self-service key provisioning application, securely pushing out APIs that would have normally been hidden behind firewalls or administrative processes. For each API in the system, whether a service or a package plan, customers can now associate roles and permissions, effecting the portal experience such that the associated I/O Doc, if defined, is either shown or hidden and the API itself is either shown or hidden in the application registration form, i.e. the page where developers get new keys. 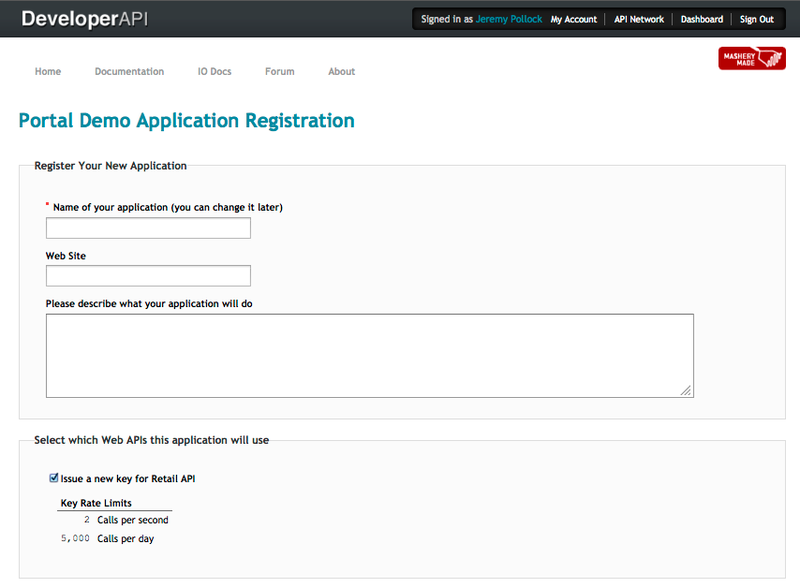 An API provider currently exposes a Retail API through their Mashery-powered portal. 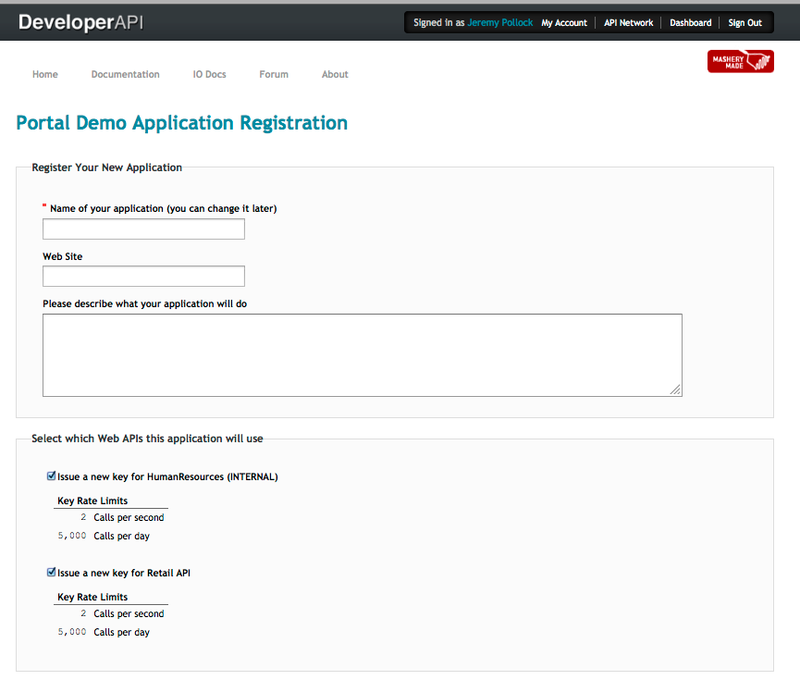 Any developer can come, register, see the I/O Docs and get keys for that API. The provider now wants to allow its internal developers to also have the same sort of experience - seeing I/O Docs and getting keys - for an internal only API. In this case, the company has an HR related API that they want to expose through Mashery but in a controlled way. An internal developer has logged into the portal and clicked on the I/O Docs page. At this point, they only see the one that is visible to all developers, regardless of role. The same internal developer has logged into the portal and clicked to get a new key. At this point, they only see the API that is visible to all developers, regardless of role. The administrator has gone in and enabled the internal API as being visible to users with the Internal Developer role, both on the I/O Docs page, i.e. "read" permission, and the application registration page, i.e. the "register_keys" permission. The internal developer has logged into the portal and clicked on the I/O Docs page. At this point, they now see the I/O/ Docs for two APIs, the one that is visible to all developers, regardless of role, and the one targeted to Internal Developers only. The internal developer has logged into the portal and clicked to get a new key. At this point, they now see two APIs, the one that is visible to all developers, regardless of role, and the one targeted to Internal Developers only. NOTE: The ability to set access control rules, per the above, is available in your Mashery administration dashboard. If you want your developer portal to enforce those rules, please contact support@mashery.com and we will enable that for you. Once enabled, there will be default permissions set in order to not disrupt the current portal behaviors experienced by your developers, i.e. we can turn this feature on for you and there is no immediate impact to the portal experience. You can change those default permissions as you see fit.